01/01/2006 Winter 2005 Newsletter : Challenge Tastic! 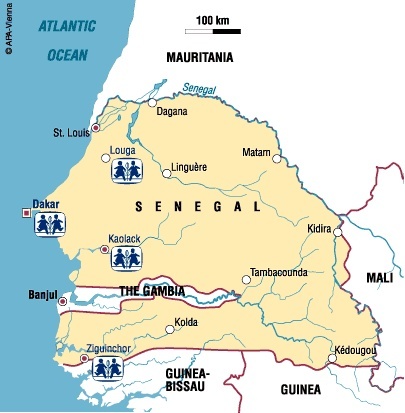 Senegal is on the western-most part of the bulge of Africa, on the Atlantic coast, and is one of the frequently drought-stricken Sahel countries. One of its greatest problems is migration from rural areas to the urban centres and their resultant growth, coupled with unemployment. Agriculture is still the most important economic sector, and Senegal is one of the world's biggest producers of peanuts. Since independence, a low-level separatist war has been going on in the southern Casamance region, which is separated from the rest of the country by The Gambia. Thousands of people have fled to Guinea-Bissau where refugee camps are strung along the border. Occasionally, government forces launch cross-border raids as part of the fight against the Movement of Democratic Casamance. Infant mortality and maternal mortality levels are moderate in Senegal, and the prevalence of HIV/AIDS is among the lowest in the region. However, immunization coverage has been declining in recent years and progress in education has been slow with only three in four children enrolled in primary school. In 1983, the charity added a community at Kaolak with ten family houses. Kaolack, Senegal's second largest city, is 200 km east of Dakar, in the most densely populated part of the country. It is an area of extremely high temperatures, with brackish drinking water and swarms of flies and mosquitoes all year round. As well as the village kindergarten, a primary school for the local community was established in 1984 because of the high rate of illiteracy. With only one hospital available locally, a mother and child clinic was built to serve the region, which was extended in 1993 to include a paediatric unit. Over 200 patients a day receive treatment at the clinic, about a quarter of them children. To help combat the extreme poverty around Kaolack, a family strengthening programme was set up. The aim of the programme is to improve the living conditions of the children of poor families (giving them food, medicine, helping with their edication) and to support to the parents (by giving them help with obtaining employment) and thus to prevent prostitution and drug trafficking. SOS Children's Village Louga opened in 1990. About 200 km north-east of Dakar, the climate here is extremely hot and dry with little vegetation, the whole region suffering from the unrelenting expansion of the Sahara. The local population makes their living mainly from subsistence agriculture and trade. The village has ten family houses and a kindergarten and primary school. Schools in Louga provide education for the children after primary school, and an SOS vocational training centre in the village provides older children with the opportunity to acquire marketable skills to help them to become independent.. A family strengthening programme has also been opened in Louga to support vulnerable children and their families in the local community. In August 2005 heavy rainfalls caused devastating flooding in Dakar and Kaolack. SOS Children’s Village Senegal in cooperation with the government started an emergency relief programme and provided the affected families with basic food, medicine, mattresses, mosquito nets etc. 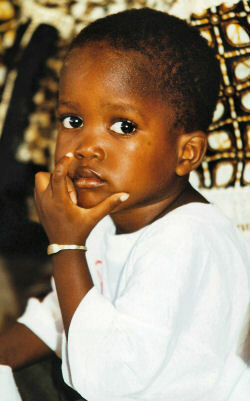 This emergency relief programme ended in December 2005 having supported 1130 children in 326 families. 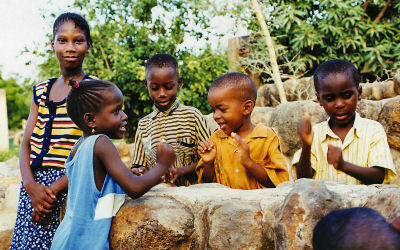 Senegal’s fourth SOS Children’s Village is in Ziguinchor, close to the border with Guinea-Bissau in the extreme south. Built in 1998, the village has ten family houses which are home to 100 Muslim and Christian children. The kindergarten has four classrooms and room for 140, most of whom come from the local community. The older children go to local schools and there is a small dispensary and a hospital close by.